…may become a wolf when the wolfsbane blooms and the autumn moon is bright. That little poem of folklore gets repeated several times in 1941's The Wolf Man which, like all the other classic Universal horror films of the 1930s and '40s, I saw for the first time at a young age, before I'd even started school. That rhyme of warning is so short and simple, I memorized it early and never forgot it — or much of the movie that contains it either. The Wolf Man was a latecomer to Universal's monster mash, premiering 70 years ago today, a full decade after Dracula and Frankenstein began the trend, The Mummy joined their ranks and many sequels popped up in the interim. However, the 10-year wait proved beneficial for The Wolf Man as a movie, gaining it better production values, a cast with higher marquee value and what may be the most literate and philosophical screenplay of any of the Universal horror films. 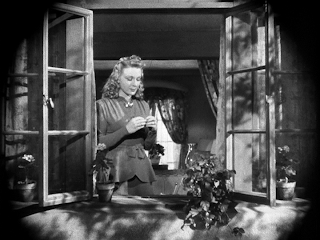 Written by Curt Siodmak, what separates Larry Talbot's werewolf from the other monsters within the Universal fold is the story's more psychological approach. Certainly we feel sympathy for Frankenstein's monster, but he's not evolved enough to feel sorry for himself and he can't wish, as Talbot does in later installments, for his own death. As a werewolf, he may become a predator when his transformation takes place, but Talbot takes no joy from it the way Count Dracula does. Until I looked at Siodmak's prolific credits on IMDb, I didn't realize that the 2010 film The Wolfman starring Benicio Del Toro was an actual remake of the 1941 film. 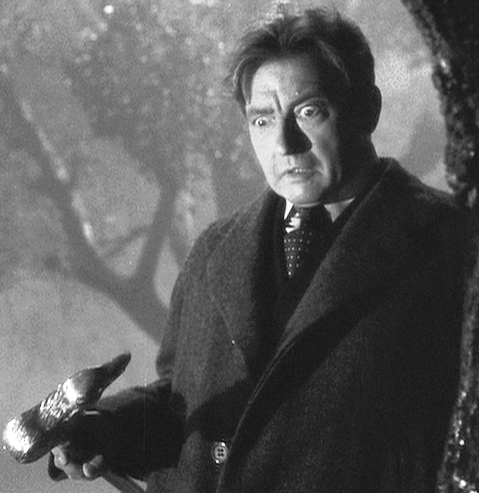 Del Toro played Lon Chaney Jr.'s role of Lawrence Talbot and Anthony Hopkins took on Claude Rains' part as his father Sir John Talbot. Having not seen the 2010 film, I have no idea how closely it follows Siodmak's screenplay, though I'm certain it improves on the makeup effects. Admittedly, the makeup by Jack Pierce, while impressive on its own, doesn't show us the facial transformation as I remembered. In my mind, I always recalled the still shots that showed Chaney's face changing into that of a werewolf, but I must have been confusing my Talbots with later outings which did show that, as you can see in this YouTube clip that compares the metamorphosis in The Wolf Man which only showed Talbot's feet changing and Frankenstein Meets the Wolf Man in 1943 which showed his face undergoing the transformation (though the quality isn't great). Hopefully, this will stay. Three times I've placed clips that have gone away later and this one is the same one that was there before. In the 1941 original, we don't see his face until later when it's complete and in reverse when he "dies." In a documentary on the werewolf legend in film on the two-disc special edition DVD, Oscar-winning makeup artist Rick Baker (who won the first Oscar in that category for An American Werewolf in London) heaps praise on Pierce as a trendsetter who doesn't get the credit he deserves largely because of his reluctance to use rubber pieces in his designs, even though they had become standard practice by the time of The Wizard of Oz in 1939. 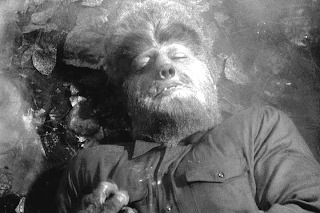 As a result, Pierce eventually lost his job in the later films though his essential look for The Wolf Man remained. From there, we see Lawrence "Larry" Talbot being driven by a chauffeur (Eric Chilton) to his family's Welsh castle after that 18-year exile in the United States. His return has been sparked because of his older brother John's death in a hunting accident. The chauffeur soon points and says, "Talbot Castle, Mr. Larry." The gargantuan Welsh estate does provide a stunning sight. 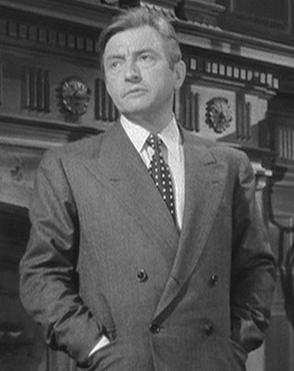 The car pulls up in front and his father, Sir John Talbot (the always-welcome Claude Rains) comes out to welcome him home. Larry steps inside his family's ancestral home again and comments that it looks the same, though his father comments that they've added some modern conveniences. 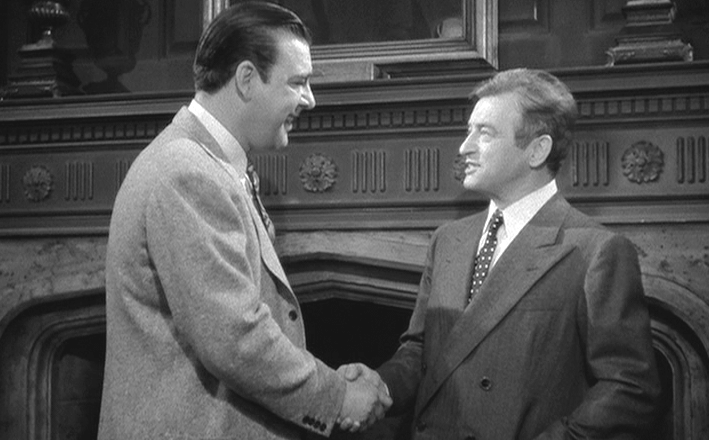 Larry also receives a surprise visitor — old friend Paul Montford (Ralph Bellamy, taking a rare break from the usual third wheel in screwball comedies), who just wanted to say hello before getting back to his job as chief constable of the district. When he departs, Larry expresses surprise to his father than Montford became a cop, a term his father isn't familiar with, so Larry says policeman, but Sir John says Montford was a captain, but he's retired. Strangely, the opening credits identify his character as Colonel Montford. It isn't clear what either Sir John or Larry Talbot do for a living, though it's clear that the family's wealth has been handed down and Sir John is a very educated man who conducts research in a variety of areas. For not having seen each other in nearly two decades, the reunion lacks tension though a definite chill continues between the two men, especially from Sir John's direction. When Larry crosses into the area of the main floor in front of the hearth, the large portrait of his late older brother John (who bears a striking resemblance to Larry) that hangs above it immediately draws his eyes and he offers his sympathies to his father. "Your brother's death was a blow to all of us.…You know, Larry, there's developed what amounts to a tradition about the Talbot sons. The elder, the next in line in succession and so forth, is considered in everything. The younger frequently resents the position in which he's found and leaves home, just as you did," his father opines while stoking the fire. "Yes, but Father, I'm here now," Larry reminds him. "Fortunately, but isn't it a sad commentary on our relationship that it took a hunting accident and your brother's death to bring you?" Sir John asks rhetorically. Rains raises the level of every film he ever made and to have him here lifts The Wolf Man to a higher plane immediately. Then again, Rains' choice of roles always were eclectic and with the exception of an appearance in a 1920 silent film called Build Thy House, Rains' true film debut came in James Whale's The Invisible Man in 1933 which Whale made between Frankenstein and Bride of Frankenstein. Larry assures his father that the perceived fracture between him and his family isn't as bad as it seems and tells him he followed news accounts and beamed with pride when Sir John won the prestigious Belden Prize for his research. "The whole business is probably my fault. The tradition also insists that the Talbots be the stiff-necked, undemonstrative type. Frequently, this has been carried to very unhappy extremes," Sir John tells his son. "Don't I know that," Larry says, almost under his breath. "Larry, let's decide between you and I that from now on there shall be no such reserve," his father suggests. Father-and-son bonding begins almost immediately with the arrival of the final parts that Sir John needs to complete a powerful new telescope he's installing in his in-house observatory. He can hardly wait to get the device working so he enlists his son's help to carry the boxes upstairs and help him set up. While Sir John Talbot might be brilliant when it comes to matters of research and theory, when something requires assembly, he often runs into trouble. Fortunately, while his son Larry might not share his high IQ, he compensates for that with an ability to fix just about anything and soon the new telescope's installation and optics satisfy his father and his son's work on it impresses Sir John as well. Sir John assumes that Larry must work in a similar field to accomplish such a task, but Larry says he just has a knack for mechanical things. He also mentions to his father that he didn't realize that he'd added astronomy to his many areas of expertise, but Sir John denies he has. "All astronomers are amateurs. When it comes to the heavens, there's only one professional," his father tells him. After Sir John tries it out for a little while, there isn't much to see during the daytime so he excuses himself and Larry takes his seat at the large magnifying device and finds one celestial object that seems heaven sent to him — a young woman (Evelyn Ankers) in her bedroom above a small shop in the downtown area of the village, Larry determines that he must meet this woman soon. 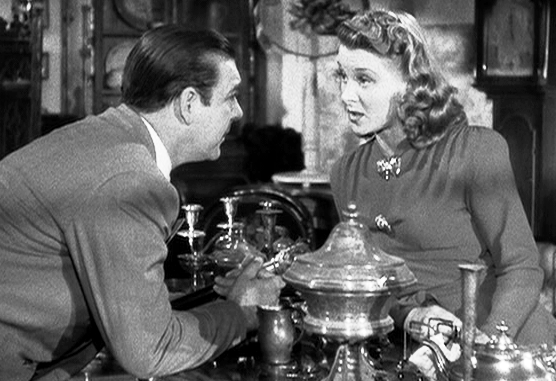 Larry takes his first step toward meeting the woman by wandering into Charles Conliffe Antiques where the young lady happens to work since she is the daughter of the owner (though Larry never learns this or her name in the entire scene). He decides to toy with her at first, acting the part of the type of wolf women more commonly encounter, saying that he seeks a pair of earrings and while she shows him some, he describes a very specific pair that he's looking for — the kind he saw her putting on when he spied her through the telescope. When he reveals that he knows she has a pair (leaving out how he knows). Gwen tells him that they aren't for sale. Larry decides that if he can't get the earrings, he'll purchase something else instead. A curious Gwen asks how he knew about her earrings and Larry tells her he's a psychic — it's a power that kicks in anytime he spots a beautiful girl. Talbot settles on buying a walking stick. He rejects the first one with a gold tip that Gwen shows him as well as the second with a dog on the handle. He likes a third though — at first joking that it would make a good putter — then he notices that it also has a carved dog on the handle and a star. He wonders aloud what that could mean. "I thought you were psychic," Gwen says. He tells her that the cane is made only of wood and silver — and doesn't have blue eyes. She explains that it isn't a dog but a wolf and that star is a pentagram and she prices the piece at three pounds, which Larry calculates as "15 dollars for an old stick." She explains to him that it's a rare piece because the wolf and pentagram are the sign of the werewolf, a creature about which Talbot at this point shows complete ignorance, asking her what a werewolf is. "That's a human being that at certain times of the year changes into a wolf," she informs him. He laughs it off. "You mean, runs around on all fours and bites and snaps and bays at the moon?" he asks. "Even worse than that sometimes," Gwen replies, adding that the pentagram marks the werewolf as well as their next victim. "Oh, what big eyes you have Grandma," Larry jokes as he flirts across the counter. Gwen confirms that Little Red Riding Hood was a werewolf story, but says there have been many others. She then becomes the first person to recite the infamous poem to him in the film: "Even a man who is pure in heart/and says his prayers by night/may become a wolf when the wolfsbane blooms/and the autumn moon is bright." Gwen still wants to know how he knew about her earrings and Larry says that she should take a walk with him that night and they'll talk it over, but she says no, then they hear the hoofbeats of horses outside. As they go outside the shop, they see the arrival of gypsies, which Gwen identifies as fortune tellers who arrive around this time every year. Larry, who still persists in trying to get Gwen to go out with him suggests they get their fortunes told that evening. Her response steadfastly continues to be, "No" but Larry tells her he'll be outside the store at 8. 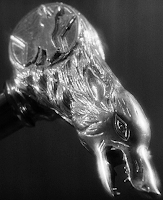 When Larry returns to the Talbot Castle, Sir John recognizes the markings on his son's new cane as the sign of the werewolf. "That's just a legend though, isn't it?" he asks his father. "Yes, but like most legends it must have some basis in fact. It's probably some ancient explanation for the dual personality in each of us," Sir John speculates. While I couldn't appreciate this aspect of The Wolf Man when I first became a fan of the film in my pre-school days, each time I've watched in the many decades since, it becomes so much clearer how this is as much a psychological horror story as it is a monster movie. Eventually, we do see that after Larry gets bitten, he undergoes an actual physical transformation, but for a little while the movie does play with the idea that it's all in his head. Even after the audience knows the curse exists and Larry does indeed change into a werewolf, when he tries to seek help and explain this to others, Sir John thinks that all he requires is some rest, Paul Montford believes Larry should be punished for committing murders and Dr. Lloyd (Warren William), whom we've yet to meet, thinks he's had a psychological breakdown and needs help restoring his sanity, not jail time punishing him for his crimes. In the current scene, Sir John even finds a book in his library with the poem and repeats it once again to Larry. Larry's a guy who just won't take no for an answer, so as promised he shows up in front of the antique shop that night despite the fact that Gwen said she wouldn't go with him. Despite her negative answer, Gwen turns up as well — though she brings a safety net in the form of her friend Jenny Williams (Fay Helm), who is anxious to have her fortune read. You'd think that where the gypsies set up shop would give the trio second thoughts as they have to walk deep into the fog-shrouded woods to find their encampment. While The Wolf Man already looks great, we really can see the decade in filmmaking advancements start to appear now through Joseph Valentine's sharp cinematography, Jack Otterson's art direction and R.A. Gausman's set decoration. Credited as associate art director is none other than Robert Boyle, who just received an honorary Oscar in 2008 for his lifetime achievement as an art director and production designer on Hitchcock's North by Northwest, The Birds and Marnie as well as other films such as the original Cape Fear, In Cold Blood, Fiddler on the Roof and The Shootist. As they slog through the murky view, Jenny notices some wolfsbane blooming by a tree, which — of course — prompts another recitation of that poem. 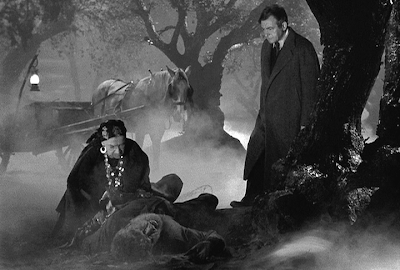 When they arrive, they find the gypsy Bela (Bela Lugosi). Jenny asks him if he can really read the future. "I will not disappoint you, my lady," he replies. Jenny begs to be the first to hear her fortune and Larry has no objection, since he wants to be alone with Gwen anyway and soon talks her into taking a stroll in those creepy woods after Jenny steps inside Bela's tent. Lurking around the gypsy encampment is Bela's older mother Maleva (the one-of-a-kind character actress Maria Ouspenskaya). Inside the tent, Bela has Jenny cut a deck of Tarot cards. 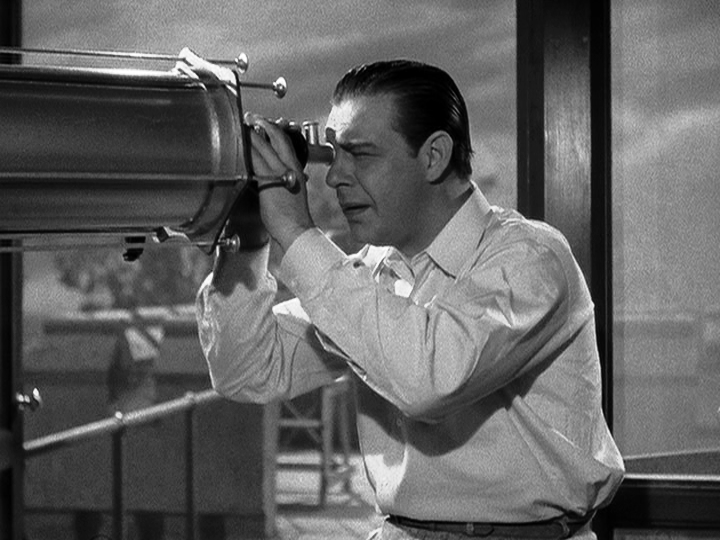 On their walk into the woods, Larry comes clean to Gwen about how he knew about her earrings (and, amazingly, she doesn't flee at the thought that he's a peeping tom who stalked her), saying it was an accident that he caught sight of her with the telescope as he was just testing the refractor. Gwen has a confession of her own to make — she kept resisting his overtures because she's engaged and will be getting. "In fact, I really shouldn't be here," she says. 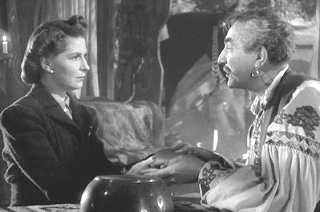 Back at the fortune teller's tent, Bela notices the wolfsbane that Jenny brought with her and suddenly grabs his head as if he has a migraine. "Can you tell me when I'm going to be married?" Jenny asks, apparently oblivious to the gypsy's pain. When she does notice how he's acting, she assumes he saw something bad and grills him about it. Bela puts on a happy face and asks for her hands, explaining that her left hand shows her past, her right hand shows her future. 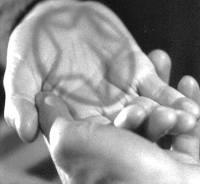 Jenny eagerly complies, but Bela sees the pentagram on her right palm and even Jenny recognizes that something has disturbed the fortune teller. "I can't tell you anything tonight. Come back tomorrow," Bela replies as he steps away from the table. Jenny persists in quizzing him about what he saw and if it was something evil. Bela won't answer — he just yells at her to go away. "Go away now! Quickly!" he shouts. Jenny follows orders and sprints out of the tent. Maleva turns and notices that one of the gypsies' horses has started acting crazy and she sees Bela standing agonized. As Jenny runs through the woods, a wolf's howl can be heard. Larry and Gwen hear the ominous wolf sound first, followed soon after by Jenny's scream. Talbot tells Gwen to stay where she is and he takes off, carrying his cane with him. Part of the genius here is that we don't see what has already attacked and killed Jenny and then takes on Larry — a tree obstructs our view so we can only see Larry whacking the killer hard with the cane. Eventually, Gwen finds him with his clothes torn, collapsed by the tree, saying he was attacked by a wolf. The gypsy woman Maleva comes by and she helps Gwen get the injured Larry back to Talbot Castle where Paul Montford happens to be. Gwen gives him and Sir John the lowdown about what happened in the woods and mentions how Maleva helped her, but the gypsy woman has slipped away as if she were never there. Montford decides to gather men and go back to the scene. When Montford and his men get there, they discover that Jenny indeed is dead, her jugular slit, but they find no evidence of a dead wolf. What they do find is the corpse of the gypsy Bela with a massive head wounds though his feet are bare. 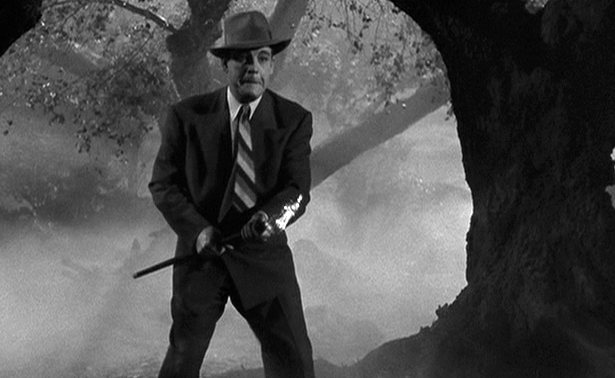 Lying near his body, they also discover Larry Talbot's cane. The next morning, Montford, accompanied by Dr. Lloyd, pay a visit on Larry to ask him some questions about the incident. Larry admits that the cane belongs to him — that's what he used to kill the wolf. They tell him they found no wolf, just the gypsy. Larry insists it was a wolf because it bit him on the chest and he opens his shirt to show them the wound — but it seems to have healed magically overnight. To go much further into the minutiae of the film's story would get into its spoilers, not that much should be a surprise after 70 years. Truly though, it's easier to appreciate The Wolf Man now than as a child. 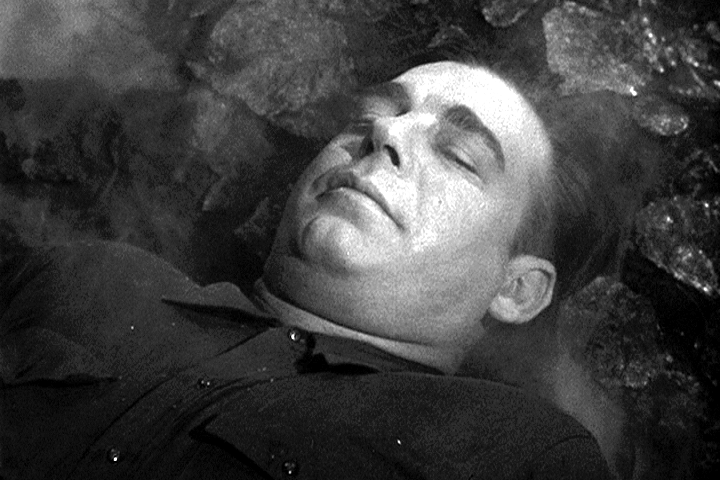 The idea that Larry might have snapped really entices me, even if the movie doesn't play with the notion long (or at all really since in the opening credits they don't say "Lon Chaney Jr. as Larry Talbot" but "Lon Chaney Jr. as The Wolf Man." 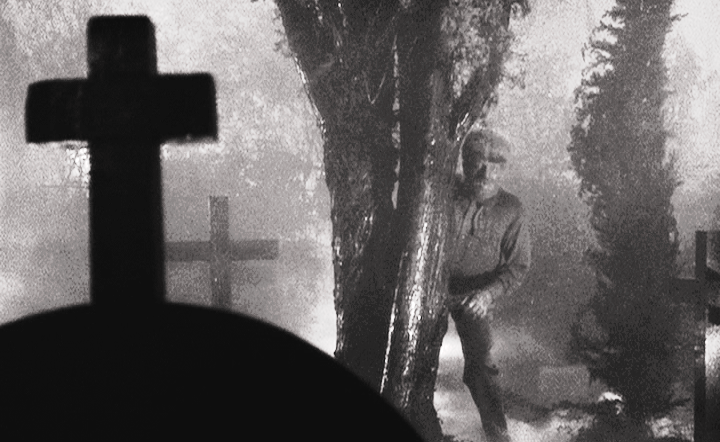 None of the classic horror films frighten that much, but few get stuffed with as many ideas as The Wolf Man. 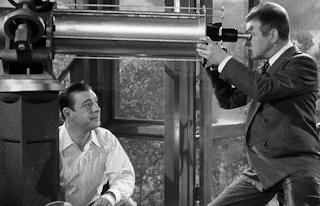 Siodmak's screenplay touches on mental health, religion, intolerance and other topics I'm probably missing. Rains' Sir John Talbot character acts as the mouthpiece for most of the ideas, but not always. Consider this great exchange between Larry and his father after Larry has come to believe he has the werewolf curse and Larry tries to ease into the discussion by grilling his dad on the topic. SIR JOHN: It's an old legend. You'll find it in the folklore of almost every nation. The scientific name is lycanthropia. It's a variety of schizophrenia. LARRY: That's all Greek to me. SIR JOHN: Well, it is Greek. It's a technical expression for something very simple. The good and evil in every man's soul. In this case, evil takes the shape of an animal. LARRY: But do you believe in these yarns? SIR JOHN: Larry, to some people life is very simple. They decide this is good, that is bad, this is wrong, that's right. There's no right and wrong, no good and bad. No shadings and grays, all blacks and whites. LARRY: That would be Paul Montfort. SIR JOHN: Exactly. Now others of us find that good, bad, right, wrong are many-sided, complex things. We try to see every side but the more we see, the less sure we are. Now, you ask me if I believe a man can become a wolf. Well, if you mean, 'Can he take on the physical characteristics of an animal?' — no — it's fantastic! However, I do believe that most anything can happen to a man inside his own mind." SIR JOHN: Time for church. You know Larry, belief in the hereafter is a very healthy counterbalance to all the conflicting doubts man is plagued with these days. The crucial words contained in that exchange come when Sir John tells Larry, "…the more we see, the less sure we are." While the elder Talbot says those words, he also declares with certainty that a physical transformation of a man would be impossible, a belief he will have challenged in the harshest way possible at the movie's end when he's placed in the same position that Larry was when he tried to save Jenny, only Sir John rushes to save Gwen and uses the same cane to kill the wolf and then watches in horror as he sees the creature revert to the human form of his son. Rains' facial expression is remarkable when you consider that the actor has to conjure what the proper look would be for something that no one has experienced in real life. Another of the many great conversations come when Dr. Lloyd tries to convince Sir John to get Larry help, but Talbot resists and Lloyd questions his motive. 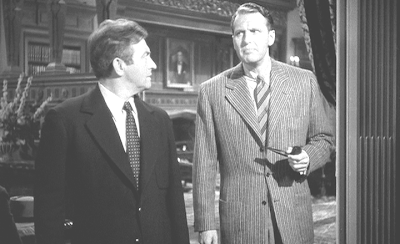 DR. LLOYD: Sir John, your son is a sick man. He has received a shock that has caused severe psychic maladjustment. You must send him out of this village. SIR JOHN: You're talking like a witch doctor. If my son is ill, the best place for him is in his own home proving his innocence. DR. LLOYD: Does the prestige of your family's name mean more to you than your son's health? 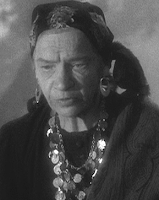 I can't end this without discussing in more detail about the great Maria Ouspenskaya as Maleva. 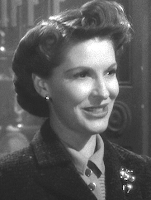 She was nominated twice for the supporting actress Oscar — each time for single scenes in a movie: in 1936's Dodsworth and 1939's Love Affair. Her character has all the answers and appears to be the only one who can calm the werewolves and lead them to peace after their deaths. "The way you walked was thorny, through no fault of your own, but as the rain enters the soil, the river enters the sea, so tears run to a predestined end. Your suffering is over, Bela my son. Now you will find peace," Maleva prays, first over her son, later over Larry. Ouspenskaya was a unique presence in every film she appeared in starting with silents in 1915 through 1949, the year she died. Her age was a subject of dispute. Her headstone gives her birthdate as 1887 but other records dating back to her birthplace in Tula in the Russian Empire say 1876. She also was a diminutive presence, standing a mere 5 feet 1½ inches tall. One of my top 5 films all time.getting poem and wolfman face tattooed on my ribs . This looks like it would keep me on the edge of my seat! The relationship discussed between the idea of the werewolf and schizophrenia is really intriguing to me! I'll have to check out the 2010 version, unfortunately it's probably not shot in B&W.